Scanned all the girls yesterday with great results. We only have 6 breeding animals not in calf, not bad when you think about all the messing about they went through with the AI and Embryo programs and the fact that Brigadier went lame in the middle of the season. Brigadier managed to get 38 out of 40 in calf, Rock Star managed to get all his girls in calf (mummy Tanya is very proud of him) and Romeo got 12 out of 16 of the AI and Embryo fails in calf along with another 2 young heifers. 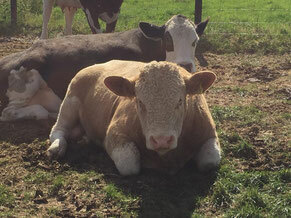 We start calving towards the end of October with 2 pedigree Simmentals and then again in mid January with 1 pedigree Simmental and 72 commercial cattle having a range of Simmental X, Aberdeen Angus X and of course our pedigree Red Angus Embryos. Looks like I will be a busy boy!